Franklin Scholars partner school wins the Pupil Premium Award! Great news! The Brentford School for Girls has been awarded the prestigious Pupil Premium Award, partially because of their work with Franklin Scholars! The prize, worth £25,000, was given in recognition of the school’s work in supporting all students to achieve their full potential. Brentford is one of only a small number of schools to have received an award. Brentford School for Girls has been recognised for the imagination and creativity with which it is applying the Pupil Premium. In addition to working with the Brilliant Club, the school is one of our partner programmes, whereby Year 10 students are matched with younger students through our signature peer mentoring programme. 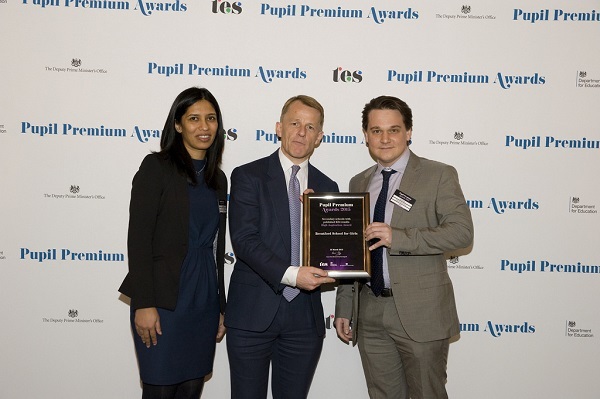 As noted in news coverage, Devesha Singh, Assistant Headteacher responsible for inclusion, and Brogen Thorpe, Finance Manager, received the award on behalf of the school at a ceremony in central London. The award was presented by government minister David Laws. News coverage of the event can be found here. Want to know more about which schools we partner with? Check out our partnerships page! Photo courtesy of Brentford TW8.